I played Theodore the Monk, three other featured roles and numerous Danes and Saxons on Group Day in the "audio movie" The Dragon and the Raven, based on G.A. Henty's book of the same title. We recorded it in London, England! You can order your copy now. Joyce and I were really pleased at how it all came together! Heirloom Audio produces world-class radio dramas, recording in London and LA. Their flagship program is The Extraordinary Adventures of G.A. Henty. 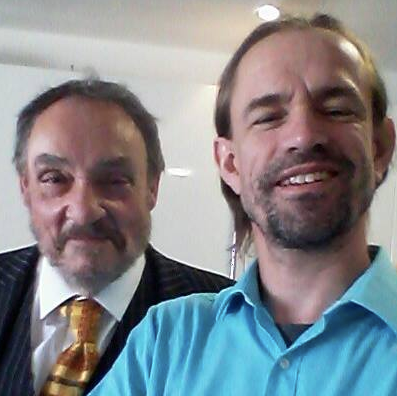 I got to work with John Rhys-Davies (The Lord of the Rings). I brought him a poster from Beyond the Mask, in which he plays the villain, Charles Kemp. I played Dr. Bonneville in the film, and I told JRD (as he was affectionately known in the studio) that I apologized for patching up that infamous scoundrel William Reynolds (the hero of the film). JRD scowled at me for a full beat before bellowing, "I should have had him poisoned!" It was great fun to play with him in that moment, and he brought great fun and creativity into the booth as well, playing the father of Helen George's character. On Group Day there were five to ten of us portraying massive armies on both sides of the battle. At one point Helen came into the booth and we ceased our grunting and bellowing to welcome her. She was gracious and kind and told me behind the scenes stories from Call the Midwife in which she plays Trixie. She said the opening episode of season one--in which a baby comes back from the dead--is based on a true story. John Bell, who helped slay the dragon in The Hobbit, helped The Dragon set sail in this adventure. The dragon, in this story, is a ship and a symbol of a nation which has lost its faith, like a dragon with no fire. I wasn't the only foreigner performing an English accent amongst Englishmen. John came down from Scotland. 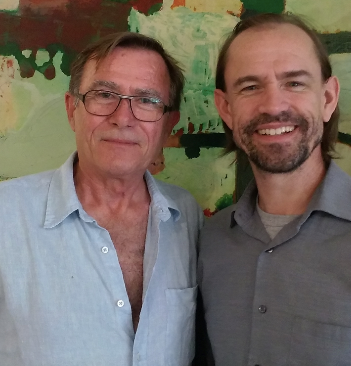 Brian Deacon (Jesus of The Jesus Film) and I played brothers. I was able to tell him that our denomination, The Church of the Nazarene, has tripled in size since we started partnering with The Jesus Film in the mid-90s. I also mentioned that I went to seminary with people who were there because of The Jesus Film. He was curious about my seminary training, so I was able to tell him how the Lord clarified my calling while I was at Gordon-Conwell Theological Seminary: I was to minister through the performing arts, not as a pastor. "And now here I am playing a monk." 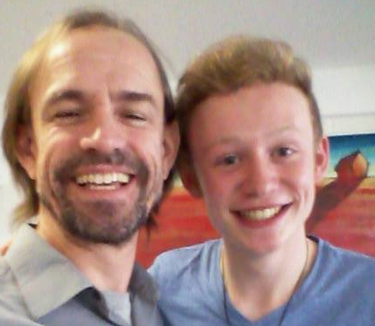 We were directed by John Fornof, who recently taught at The Rocky Mountain Christian Filmmakers Camp with me. He also wrote the script, and he's won two Emmy Awards for that skill. It's the 9th century. The Danes have invaded--and are taking over England. One by one, each kingdom falls. The Danes destroy entire villages, level monasteries and churches, and massacre men, women and children. Only one kingdom is left—a small sliver of southwestern England known as Wessex. And only one king stands against them. His name is King Alfred. And he’s 22 years old. It's all about making the story come alive in the imagination with the best actors, movie-quality sound design, and a custom music score. The final product is a retail CD, with future plans to launch as a radio drama. Past cast members include Sean Astin (The Lord of the Rings, Mom's Night Out), Kirk Cameron (Fireproof), Skandar Keyens (Narnia), Billy Boyd (The Lord of the Rings), and Joanne Froggatt (Downton Abbey). I also got to perform in all of the crowd scenes as Saxons and Danes, including the songs. Heirloom Audio was nominated for ten Voice Arts Awards and won four of them for In Freedom's Cause. This month (July) marks 20 years of working full-time in the performing arts and applied theatre. This recording adventure was an amazing way to celebrate! Hear about many of the Divine Appointments the Lord set up while I was in London here. You can direct people to this page via www.RichDrama.com/TheDragonAndTheRaven. That is so awesome!! Congratulations - can't wait to hear it!